Grind the poppes finely. Combine with semolina and salt, add eggs; then knead until elastic, stretch and cut out noodles. Toast the flaked almonds then grind finely. Place in a blender, add the perilla leaves and the remaining ingredients and blend everything until combined. Cook the noodles in salted water. Meanwhile heat slightly the almond sauce in a pan. Add some water from the pasta then add the noodles and stir to cover all in the sauce. 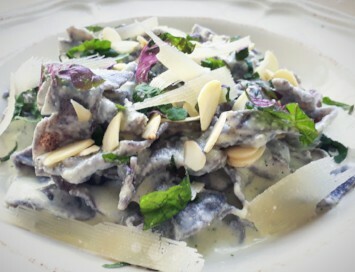 Serve garnished with some perilla leaves, almond flakes and flaked parmesan cheese.